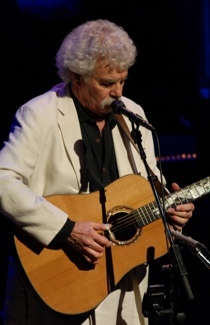 Tom Rush began his musical career in the early ’60s playing the Boston-area clubs while a Harvard student. The Club 47 was the flagship of the coffee house fleet, and he was soon holding down a weekly spot there, learning from the legendary artists who came to play, honing his skills and growing into his talent. He had released two albums by the time he graduated. Rush displayed then, as he does today, an uncanny knack for finding wonderful songs, and writing his own – many of which have become classics re-interpreted by new generations. (It is testimony to the universality of his appeal that his songs have been folk hits, country hits, heavy metal and rap hits.) Signed by Elektra in 1965, Rush made three albums for them, culminating in The Circle Game, which, according to Rolling Stone, ushered in the singer/songwriter era. In the early ’70s, folk turned to folk-rock, and Rush, ever adaptable, saw more room to stretch out. Recording now for Columbia, he toured tirelessly with a five man band, playing concerts across the country. Endless promotional tours, interviews, television appearances, and recording sessions added up to five very successful but exhausting years, after which Tom decided to take a break and “recharge” his creative side at his New Hampshire farm. Rush returned with a splash in 1981, selling out Boston’s prestigious Symphony Hall in advance. Time off had not only rekindled Rush’s love of music, it had re-ignited music audiences’ love of Rush. He instinctively knew that his listeners were interested in both the old and the new, and set out to create a musical forum – like the Club 47 of the early ’60s – to allow established artists and newcomers to share the same stage. In 1982, he tried it out at Symphony Hall. The show was such a hit it became an annual event, growing to fill two, then three nights, and the Club 47 series was born. Crafting concerts that combined well known artists such as Bonnie Raitt or Emmylou Harris with (then) unknowns like Alison Krauss or Mark O’ Connor, Rush took the show on the road. From the ’80s to the present day, Club 47 events have filled the nation’s finest halls to rave reviews, and have been broadcast as national specials on PBS and NPR. In 1999, Columbia/Legacy released a Tom Rush retrospective album that covers his recorded musical history from 1962 to the present, including tracks recorded for Columbia, Elektra, Prestige and his independent years. Entitled “The Very Best of Tom Rush: No Regrets”, the 17-track compilation includes as a bonus a brand new Tom Rush composition, “River Song,” which features vocal contributions from Grammy winners Shawn Colvin and Marc Cohn. A live CD, “Trolling for Owls” released in 2003 and published by Tom’s NIGHTLIGHT RECORDINGS, captures Tom’s complete performance and includes, for the first time, some of the spoken stories that have endeared him to audiences. “How I Play (some of) My Favorite Songs”, a DVD released in 2005 by Homespun Tapes, shows how he plays ten of the memorable songs and guitar arrangements, and has had great reviews from guitarists all over the world. In 2009, Tom recorded his first studio CD in 35 years, in Nashville. “What I Know” was produced by Tom’s long-time friend Jim Rooney and includes original Tom Rush material, as well as harmonies by Emmylou Harris, Bonnie Bramlett and Nanci Griffith. In 2012, he began a revival of his Club 47® shows at Boston’s Symphony Hall. Tom Rush: 50 Years of Music, featured old friends David Bromberg, Jonathan Edwards and Buskin & Batteau, and new friends like Dom Flemons of the Carolina Chocolate Drops. The show was streamed live, and has been released as a DVD video. He followed up with a sold-out show at Symphony Hall in 2013, with the Kweskin Jug Band, Maria Muldaur, Geoff Muldaur and Bill Keith, Patty Larkin, Sarah Lee Guthrie and Johnny Irion. And on December 28, 2014, his show featured Red Molly, a folk trio consisting of Laurie MacAllister (vocals, guitar, banjo), Abbie Gardner (vocals, guitar, Dobro, lap steel guitar), and Molly Venter (vocals, guitar); Grace Kelly (22-year old Downbeat Magazine-featured saxophonist);and Monica Rizzio (Cape Cod singer-songwriter, who performs with the group “Tripping Lily.”) Again, to rave reviews. Today, Tom Rush lives in Massachusetts when he’s not touring. His voice has grown even richer and more melodic, and his music, like a fine wine, has matured and ripened in the blending of traditional and modern influences. He’s written a number of new songs. He’s doing what he loves, and what audiences love him for: writing and playing …passionately, tenderly…knitting together the musical traditions and talents of our times.